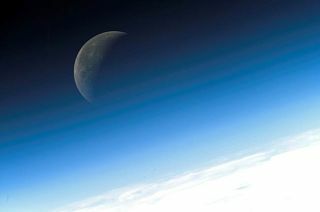 A gibbous moon visible in this view of Earth's horizon and airglow, photographed by an astronaut in 2007. Astronomers now estimate moons that form like our own--from a collision event--occur in only about one in 20 planetary systems in the universe. The moonformed after a nasty planetary collision with young Earth, yet it looks odd nextto its watery orbital neighbor. Turns out it really is odd: Only about one inevery 10 to 20 solar systems may harbor a similar moon. Newobservations made by NASA's SpitzerSpace Telescope of stellar dust clouds suggest that moons like Earth'sare—at most—in only 5 to 10 percent of planetary systems. "Whena moon forms from a violent collision, dust should be blasted everywhere,"said Nadya Gorlova, an astronomer at the University of Florida in Gainesville who analyzed the telescope data in a new study. "If there were lots ofmoons forming, we would have seen dust around lots of stars. But wedidn't." Gorlova andher team detail their findings in today's issue of the Astrophysical Journal. Shortlyafter the sun formed about 4.5 billion years ago, scientists think a vagrantplanet as big as Mars smacked into infant Earth and ripped off a chunk of ourhome's smoldering mantle. The rocky, dusty leftovers fell into orbit around ourwounded planet, eventually coalescing into the moon we see today. Thescenario is unique among other moons in the solar system, which formed side-by-sidewith their planet or were captured by its gravity. Gorlova and her colleagueslooked for the dusty signs of similar smash-ups around 400 stars, all about 30million years old—roughly the age of our sun when Earth's moon formed. Only one ofall the stars they studied, however, displayed the telltale dust. Considering thefrequency of planetary solar systems, the amount of time the dust should stickaround and the window for moon-forming collisions to occur, the scientists wereable to peg the frequency of extrasolar bodies that formed like our moon. Theestimate, however, is possibly a generous one. "Wedon't know that the collision we witnessed around the one star is definitelygoing to produce a moon," said study co-author George Rieke, an astronomerat the University of Arizona in Tucson, "so moon-forming events could bemuch less frequent than our calculation suggests." Planetaryscientists like Gorlova and Rieke think infant solar systems can form moonsbetween 10 and 50 million years after a star forms. That only a single star withcollision-generated dust could be found in their latest research, theastronomers said, indicates that the 30 million-year-old stars in the studyhave finished making their planets. "Astronomershave observed young stars with dust swirling around them for more than 20 yearsnow," said Gorlova, noting that the dust could be collision-derived or primitiveplanet-forming material. "The star we have found is older, at the sameage our sun was when it had finished making planets and the Earth-moon systemhad just formed in a collision." While most theour type of moon may be rare, astronomers think there are billions of rockyplanets out there with plentyof moons orbiting around them. The upshot for lunar lovers? There could bemillions—or billions—of Earth-like moons drifting through the cosmos.